Harvest* After each turn, if this Pok�mon ate a held Berry or used it with Natural Gift that turn, the Pok�mon regains its Berry. If the Pok�mon then meets the requirements to eat the Berry again, it will do so immediately, and will not be able restore the Berry again. 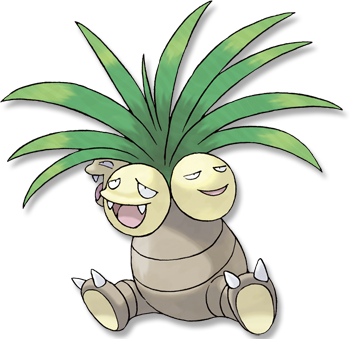 Ruby/Sapphire EXEGGUTOR originally came from the tropics. Its heads steadily grow larger from exposure to strong sunlight. Emerald Originally from the tropics, EXEGGUTOR�s heads grow larger from exposure to strong sunlight. It is said that when the heads fall, they group to form an EXEGGCUTE. FireRed It is called �The Walking Tropical Rainforest.� Each of the nuts has a face and a will of its own. Leaf Green It is said that on rare occasions, one of its heads will drop off and continue on as an EXEGGCUTE. Diamond/Pearl It is called �The Walking Jungle.� If a head grows too big, it falls off and becomes an EXEGGCUTE. Platinum It is called �The Walking Jungle.� If a head grows too big, it falls off and becomes an EXEGGCUTE. Heart Gold Its three heads think independently. However, they are friendly and never appear to squabble. Soul Silver If a head drops off, it emits a telepathic call in search of others to form an EXEGGCUTE cluster. Black It is called �The Walking Jungle." If a head grows too big, it falls off and becomes an Exeggcute. White It is called �The Walking Jungle." If a head grows too big, it falls off and becomes an Exeggcute.